My name is Klaus Wunnenberg, I am a resident of Los Santos, just like you. I believe the main duty of every single person in the United States of America is to serve for their country, whether it be in the the army or following the law and paying your taxes, it is essentially the same thing, because you are helping your country, despite what group you are apart of. I am not a tremendous business visionary running an expansive enterprise and I don't own several organizations, instead I am an American citizen who has worked for my wage and am currently reinvesting what I can into my city. Unlike others I am not looking for a position to pick up power or a status, I am looking for a position to represent the people! To achieve a decent society we need a perfect environment for all individuals. Including a solid domain, youth welfare, and flexibility of belief without dread of System oppression or persecution. Party Platform: A fair economy: build the economy from the middle out, stimulate economic activity, and maintain a strong social safety net. Government oversight: civilian empowerment, anti-corruption, transparency, and public investigation into state agencies. Firearms control: the RHWP would aim for a system that empowers ordinary law-abiding citizens to own and purchase a firearm for protection, without excessive red tape from law enforcement. We plan to extend firearm license renewals to 5-6 months. Drug policy: The war on drugs has not been a success. Extremely permissive policies and accepting behavior merely provide criminals a market to operate in. Future changes will occur, including heavy crack downs. Klaus Wunnenberg has a extensive education in law enforcement, ethics, business, a degree in philosophy, these are adequate m skills for a perfect leader willing to bring major and much needed improvements to this city. The Rationalist Homeland Workers Party is a mix of right and slightly center ideologies with the basis being true Democracy. In order to show a simplified or easy understanding of where the RHWP is winged, we will provide easy written definitions. Government support, unemployment insurance/welfare, yes/no. The RHWP wishes to provide financial support, for individuals who are victims of false employment termination, unable to legally obtain a job (medical disorder or permanent injury) or are unable to financially support their family and children. No man or woman should ever be destitute and ineligible for assistance until they are able to find a source of income via family or work. Those who refuse to contribute to society should not expect anything from us. The modern society we are apart of is influenced negatively by "crime culture" and urban trends. We do not believe in and will not impose restrictions against any trending influences (music & arts, brands, ect) , we are concerned about the crimes that happen because of the smallest things that go on. Daily shootings and violence repulsive crime is happening every day and it is affecting our youth, elderly and every other class of citizen we house in our great city. We care deeply for victims of all crime and desire dearly to see eye to eye with the many victims in Los Santos because of the broken or unstable individuals who are driven to commit crimes. Youths are also a majority of the people who are raised in areas burdened with crime or are addicted to hoodlum life style, and we hope to establish the Wunnenberg Youth Program (WYP), a free program that will teach kids life skills and offer a comfortable a place to enjoy instead of hanging around the streets. The Rationalist Homeland Workers Party holds a strong passion for democracy as it is what The United States was built upon, many morals and values that help influence people to stay on the right track, and do what is best. We believe in positive mentality, old morals that help people live a productive and happy life style. We favor old American Tradition, where the provider for their family can work for their honest day's pay and come home to enjoy dinner with their family, and relax. The American Dream may be hard to accomplish, but if we as a whole can help improve society, lower crime rate and create new jobs, people will be able to resort to doing legal work and feel proud of it! - Fix taxes, based on class of wealth or revise the tax credit/return system. - Welfare for poverty stricken citizens. - Raise the social standards of today. It is our mission to handle the evergrowing housing crisis that Los Santos is confronted with. Measurably, the worker , an example being a RS Haul Driver earns between $1,250-$2,100 every hour, if they somehow happened to work three hours for each day, they would acquire between $3,750-$6,300. The normal cost of a residence in the region of East Los Santos is between $50,000-$150,000. There is definitely no budgetary sponsorship from banks, as home loan credits. These figures suggest that the worker alone needs to work twenty six days relentless, with no breaks keeping in mind the end goal to manage the cost of a home, thinking about if the laborer has no everyday costs, for example, gas, electric, medical care, auto insurance, and obviously cash for basic groceries. Individuals experiencing childhood in Los Santos are being brought up in houses too little, and rents are taking up increasingly of an occupant's wage. We value saying that we will handle this issue head on and make more homes for the meriting people. We are committed to the construction of new properties over the city, concentrating mostly on the low-spending zones of Idlewood, Jefferson, Seville, and Ganton, of which as of now have the most astounding number of destitute residents over the state. The development of the new properties will create a large number of new employments and thusly businesses of traders and greatly improve local economies. With great lack of innovation in modern times, under the Wunnenberg Administration, Commissioner Klaus Wunnenberg and his Deputy will initiate a immediate science program and division of the County Government. The proposed division will be named "County Ministry of Research & Development" (CMRD), it's core focus will be to help create, innovate and develop mechanical, chemical/medical, energy and health contraptions, products and resources. Funding for the CMRD will be allocated at the demand of the public, before the CMRD is officially formed, Commissioner Wunnenberg shall take to the public with a poll, sole purpose being the public's interest in the formation of the CMRD. As apart of the science initiative, Commissioner Wunnenberg will propose plans and budgets to construct a Atomic Fission/Nuclear Energy Plant. The Rationalist Homeland Workers Party will work upon the current business loan system in order to make loans more easy to obtain, and less intimidating because of internal bureaucracy. A long term tax return program will also be incorporated for citizens of our great county. For individual citizens, businesses (large or small), we will provide tax returns on scheduled dates. Taxes are your money, you deserve that money back once it has been rightfully invested. - Approved budgets and spending (you must know where your money goes). - Outcome of IA cases of all agencies will be made public. - Direct feedback from the Citizens. The Wunnenberg campaign shall be devoted to genuine focus on the condition of business and the industries that provide it inside Los Santos. We realize the issues of crime, violence, and the strain on social administrations can't be tended to without additionally tending to the condition of work inside Los Santos. Compared with other urban communities in different states the opportunities available are essentially not what they ought to be for the thriving of the general population of Los Santos. The Wunnenberg campaign intends to work with both private and public organizations to facilitate the difficulities in working inside Los Santos and additionally give motivating forces to organizations to give sufficient business. We expect to do a full monetary audit and execute vital projects to address the deficets in different financial divisions of Los Santos. Just by empowering the development of a wide assortment of business and industry will a full scope of chance be accessible to the subjects of Los Santos. Employment that can give a safe and significant presence should not be an extravagance or irregularity. The path forward to a more beneficial, quiet, and genial city is by guaranteeing that each subject has an opportunity to excel and apply their abilities and gifts to productive closures. As the foundation of any society, we recognize the supreme importance of a healthy farming community. Accordingly, we demand protection of the family farm by eliminating speculation in land and commodities, and by assuring a stable market and fair prices for the farmer, as well as the consumer. and environmental stability while serving as a constant source of spiritual renewal for man in close rapport with nature. Hence, we believe that a farmer's land and the fruits of his labor must remain inviolate and above commercial speculation and exploitation, just as the economic viability of the family farm must be re-established so that significantly larger numbers of our people can once again find a good life upon the land. It is our goal that the city be totally self-sufficient in energy, and that the types of energy it employs be non-polluting. Towards these ends, we demand a phasing out of all forms of energy which befoul the environment, such as coal and petroleum. To replace them, we demand an immediate and massive program to develop new, CLEAN energy sources and atomic fission energy plants. We believe that all citizens deserve to live in a healthy environment, with clean air, clean water, and clean land. We also believe that the responsible energy needs of our people must be met. At the same time, we do not believe that the environment should be sacrificed for quick profit, cheap economic growth, or an extravagant, materialistic lifestyle, only projects that will be beneficial to all citizens will be honored. We believe in honoring, not despoiling Nature. We firmly believe that with the wonderful resources of the North American continent at its disposal, people genius is fully capable of developing those sources of energy we need - from the sun, the earth, the wind, and the water - without disturbing the natural order. Reaching out to and connecting with the community is a important and vital part of any city or town. The people who live in their city must not feel as if they're just robots paying taxes and following the law but should be given the chance to attend public/community gatherings where they can enjoy themselves or discuss concerns they have with fellow members of their community. Fellow citizens are important to me but should also be important to you, because without them there is no social order or system we abide by, such as the one this country was formed by. I plan to dedicate and invest my time and fullest effort into aiding this community, and will stop at nothing to make sure that we see a glorious future. We strive to make our districts one of the most safest and economically productive place in the state. In order to combat crime we must crack down on supervision of areas patrolled the least to help detect and deter crime, as well as implement new forces or programs to aid this effort. Crime does not always occur openly and can goes undetected quite frequently. To put an end to any class of crime, as well as white collar crime we must call for more active usage of our constabularies spread through the district. Despite attempts to combat crime, it is only sending officers to their death, day after day. We require a system that will help improve the way crime is tackled as well as the ability to protect officers who do their job. Crime has purged many areas, and it is due to financial failure or neglect. Underleadership of the RHWP, no part of the city shall ever lack any plans to revitalize run down areas will also be put in place. It is with great joy I announce my appointment of District 1 Supervisor. Under my reformed party. I wish the very best to the other candidates and fellow councilmen. 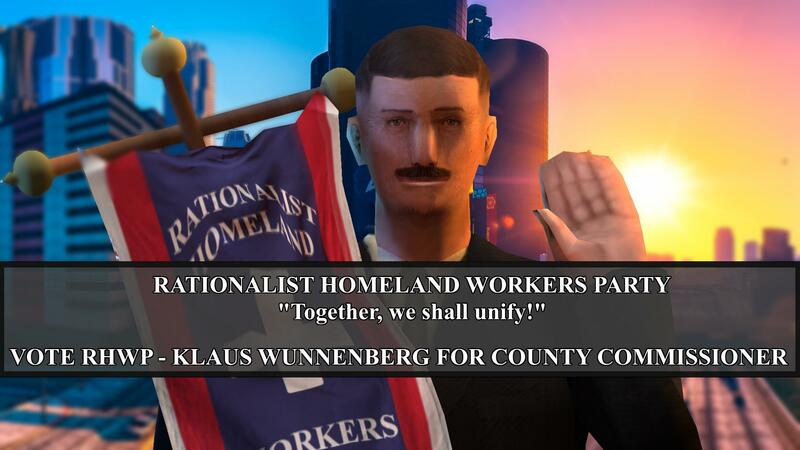 Leader of the Rationalist Homeland Worker’s Party, Klaus Wunnenberg may seek the position of County Commissioner in up coming elections, stay tuned. Klaus Wunnenberg is officially running for the position as County Commissioner, under his revised party, The Rationalist Homeland Workers Party! A public rally will be held within the next 1-2 weeks addressing the return from our hiatus. Party Chancellor Klaus Wunnenberg will be addressing issues that have come to life during the hiatus, how we will tackle them, our plans once elected, addressing government agencies and what the RHWP can do for the County of Los Santos. Stay tuned for updates regarding the event. We encourage everyone who is interested in the elections, local politics and those with concerns to attend! We will be handing out American flags, temporary water transfer tattoos, pamphlets and free snacks! We will also be planning a Q&A session, possibly on the same date, or a separate one. Members of the press are eligible for special seating and viewing at the upcoming rally. We have special areas in which they are able to film and take photographs whilst being undisturbed by the crowd. We also offer interviews. All media inquiries can be emailed directly to us (( forum PM @DrJoseEviI )). We do accept donations, money donated to the Rationalist Homeland Workers Party goes towards paying for events and party operations. Charity drives will be hosted at a future date, we will specifically state if proceeds go to charity when these events are scheduled. Our auditorium is located on 983 West Vinewood Blvd, across from the 4 Dragons Casino and the Vinewood Graveyard. Due to security concerns, members of the public are not permitted to carry firearms or other weapons on the premise. All emergency services workers are welcome, along with their firearms, given that they are on duty or off duty with their badge on person. Before entering the public seating area of the auditorium, you will be forced to walk through a metal detector. We will not be performing frisks, so if you set off the detectors, you must exit the building and leave whatever items that set it off in your car. Reminder about the rally tomorrow, make sure to attend! We stand now, at the precipice. Our great County once more threatens to crumble, to topple into the sea of lawlessness and despair that has ruled us all for years. In short, my dearest Los Santos - we are at war. It is only a matter of time before the election, where the great people of Los Santos will come to vote. Let them come, I say! Vote for Klaus Wunnenberg, the man will lead this County to salvation! Our opposition will follow us, traitorous wave, after wave will crash against our walls. The Opposition will fail! All those who fight against a free and prosperous county will fail! I am Party Chancellor, Klaus Wunnenberg, and this is my pledge -- no one, NO ONE will take this great county away from us! God bless Los Santos and God bless America! Be sure to cast your vote on April 27-28th. Vote for Klaus Wunnenberg! Below is a written transcript of Party Chancellor, Klaus Wunnenberg's speech. Hello once again, Los Santos! I am proud to be with you all, and I thank you all for your attendance and viewership. I am glad to see you all and to be on the podium once again, delivering my messages of truth and prosperity to you! I’ve been gone on a two year hiatus, due to reasons pertaining to member of my family’s health, and the corruption imposed against us! Despite all odds, I am here once more, representing the American people for a better future! Let's talk about government, shall we? Or, more specifically, YOUR government, dear Los Santos - the future government. Just who is the RHWP? Why, now, that's simple. 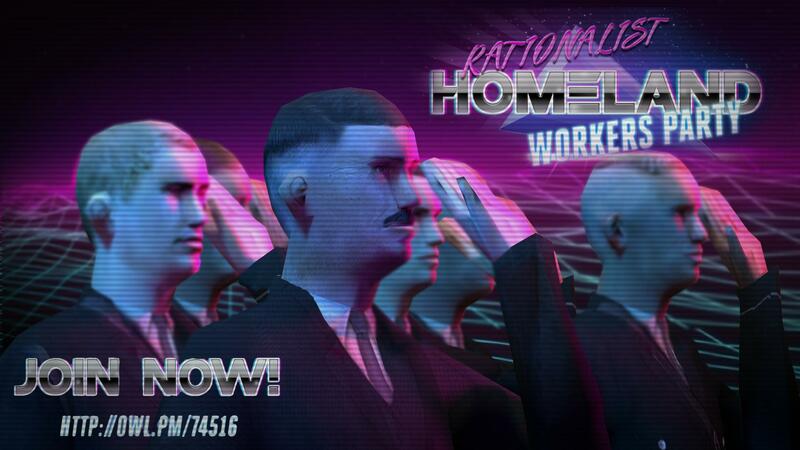 The Rationalist Homeland Workers Party is you, Los Santos. The RHWP is your sister, your aunt, your friend, your neighbor. And, well, yes... the RHWP is me, as well. As Chancellor of our prestigious party, it's my responsibility to preside over our great democracy once elected. So, as your future Commissioner, I am the voice, I am the heart and soul of the people. But only together, TOGETHER, can we hope to reach our full potential. The way we were before the incompetents: Whole. Beautiful. Powerful. We put our trust, our faith, in halfwits. Our intrepid leaders had everything they wanted! Power. Wealth. Prestige. And it made them lazy, Los Santos. Oh yes, and laziness breeds stupidity. Rest assured, I will not make the mistakes of my predecessors. When Klaus Wunnenberg builds a county, he builds it to last. The American way. Don't you, my fair citizens, deserve that? Don't you deserve a future free of corruption, and fear, and terrible uncertainty? Of course you do. As future County Commissioner of Los Santos, you have my solemn pledge that I will never rest, NEVER rest, until we all have what we deserve: A place to truly call... home. With the resurgence of the Rationalist Homeland Workers Party, our forces are tripling in numbers, exceeding the rate we had before! Without further delay, this is my message to the people of Los Santos. We as a party pledge to work. We are Rationalists, our decisions are made based off logic. Far to many mishaps, acts of corruption, and lazy leadership has plagued this county for FAR TOO LONG! I have had enough of the evil trickery that has embed itself in the leadership of this government. You should too! Examples of previous leadership has proven time and time again, that they will misuse their power and enact law against the people who dare speak out against them. A paradise is not a paradise if the people therein do not sway freely as nature allows! As all things change, so do your enemies. We are now faced with a new group that charades as something they are not, a spy in our midsts. This new group is attempting to deceive you with common political branding when it is obvious they have no interests of the American people in mind! This new group has stolen the political tag of Republicans, they seek not to free us but to cause anarchy. Anarchy is the child of Communism, a spawn of evil itself! Garry Hopkins is a Anarcho-Communist in disguise who wishes to take individual freedoms away. Manjot Singh is a collaborator with foreign arms dealers, who has worked with illegal arms dealers who were employed at a legal front at the JGC Mall. Communists are criminals, and people who work with them are too! With the resurgence of the Rationalist Homeland Workers Party, once elected swift changes will be implemented. Direct contact with all government agencies in the county will be established, we will ensure our leaders are fit for their position, I have no doubts of our current leadership and I will see to it that we have the best, THE BEST communication and exchange so we may work towards further improvements! We will eradicate the fortifications acts, a ordinance that was enacted as a part of a personal vendetta against myself and my paper by the government. The people will not suffer from arbitrary power of deciding who gets to fortify their homes and who does not, no one shall be subject to arbitrary safety! We will extend firearm license renewal periods to five months, rather than three! We will begin immediate action to incentivize science research, instating a County funded science program and build environmentally friendly, long term and sustainable energy production facilities. Funding for local businesses shall be easier to acquire by simplifying the application process and the internal bureaucracy to process them much more quickly and efficiently. We will directly establish business contracts for many public services to help support the local economy! Our government will be hundred percent transparent, upon request of the public, we will disclose non-personal nor case sensitive information about our work, plans and actions. All other agencies in the county will adhere to this level of transparency too! All our actions shall be immediate and firm, we will not back down from what we pledge to this County. We are not politicians, we are workers, we are the people, we are Americans! We are the people, the American people and no longer will this fine county suffer from the corrupted evil and liars that has held it’s reigns! So as I come to the end of my speech I want to ask something of those among you who are true believers and loyalists to our cause. As citizens of the county and workers, we call upon you join our forces, enlist as a Sentinel! 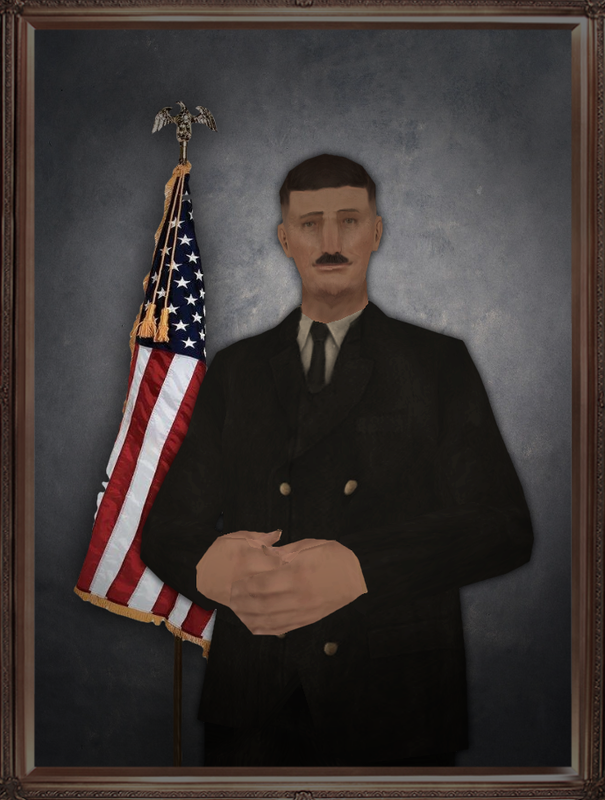 No matter how many insults and slanders you may hear if you do join, you all know that the Sentinel Division have been formed for your protection, the protection of the public, our protection, and at the same time not merely for the protection of the Movement, but for the protection of a the County that is to be great once again. If you are reviled and insulted, good luck to you, you will be in a force dedicated to peace, prosperity, safety and freedom! Every battle must be fought to the end, better that it come early than late! And he who stands most securely, who from the get-go, joins the fight with the greatest confidence. And this highest confidence we can carry with us in our hearts. For those who on our side is today the savior of the American people, God's truth! We have nothing to win but perhaps only everything to lose. Those, who today fight on our side will win great quarrels , far more than thou who will want only to win great material goods. He who today, be a leader must be a rationalist, if only for the reason that he leads is to campaign against those against who seek oppress and conquer! God bless you all, and god bless America, together we shall unify! The Rationalist Homeland Workers Party is willing to do a public Q&A session, all would be welcome to attend. People attending will get the chance to ask three questions each of Party Chancellor Klaus Wunnenberg. We urge you to place a vote on our online poll, a yes vote would be towards a Q&A, no would be against it. The Q&A will be held Friday, April 26th (the night before the elections). If you have any interest in local politics, or have concerns for the future of the County after the upcoming elections, we encourage you to vote yes and attend! The poll will end on Tuesday, April 23rd. Communist Threat - The Vorostavskaya Organization. Easter Night April 21st 2019. An attempted assassination was made against Party Chancellor Klaus Wunnenberg while spreading news of the Rationalist Homeland Workers Party. A soldier of a Communist organization, identified as the Vorostavskaya attempted to box in Klaus Wunnenberg in the party advertising truck and rob him of what they assumed to be a truck containing valuables, little did they know it was empty. Klaus Wunnenberg, the brave leader he is refuted the thugs demands for access to the truck and monetary payment at threats of violence. The thug drew a gun on the Chancellor and he returned immediate fire, returning back to Chancellery after the Communist fighter retreated. Chancellor Wunnenberg has contacted the authorities and is waiting for a response in regards to this. Changes will be made and police crack downs will commence against the Vorostavskaya. No criminal communists shall roam free while they impose such dangers. Remember, together we shall unify! "Communists are criminals, and people who work with them are too! With the resurgence of the Rationalist Homeland Workers Party, once elected swift changes will be implemented." ~Klaus Wunnenberg, RHWP April 14th Rally.